Well, just to let you know, I'm NOT happy with this, but it's the best picture I came up with. I did a lot of crumpling up while sketching Miragaia. 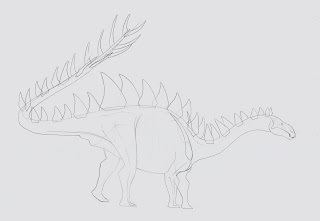 Part of this is because I'm not that great at drawing stegosaurs, but another part is that Miragaia has a lot of missing parts. The tail here, for example, is basically fiction. Hopefully it will improve with the inks...stay tuned! The tail looks unusually long for a stegosaurid.